We noticed that many new people move to Farmington during this time of year and are looking for easy ways to find out what is happening in our town or in the surrounding area. The Puddledock Press Around the Town Calendar is put together, via submission, by the Puddledock Press, the local town "good news,' non-profit, newspaper. It has an agenda view, month view or week view, depending on how you'd like to view the info. It lists local and regional events, nothing broader than that. It is a great way to find out what is going on. The Goodwin Library has a calendar and has a great number of events monthly for children, teens and for adults. Their events are free and open to the public. 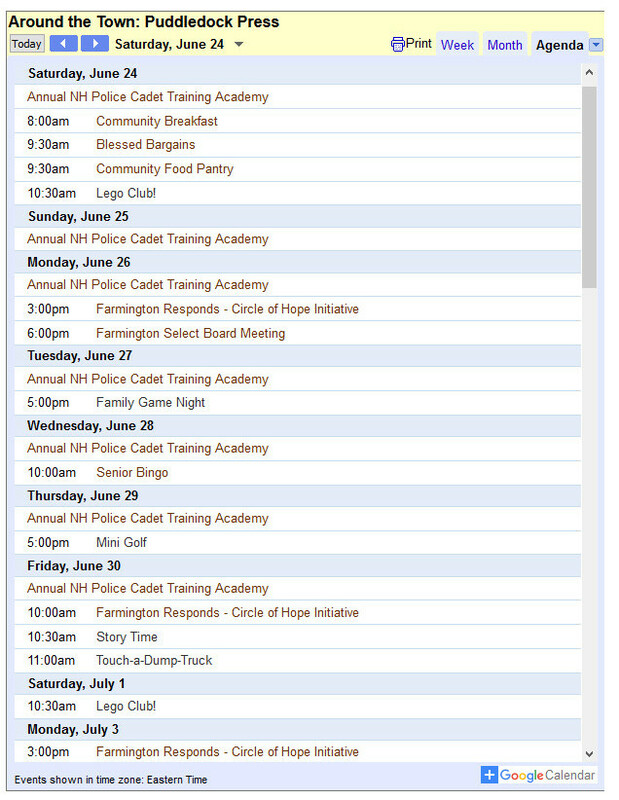 The Town of Farmington has a site with tons of general and specific information, and a calendar as well, with all municipal events, board meetings, etc included. The town also provides an option to be notified for various municipal happenings via e-mail and text message. It is best to find any Farmington school information on the SAU 61 site. As you can imagine there is always something going on at one of the schools, their after school activities, or summer programs. 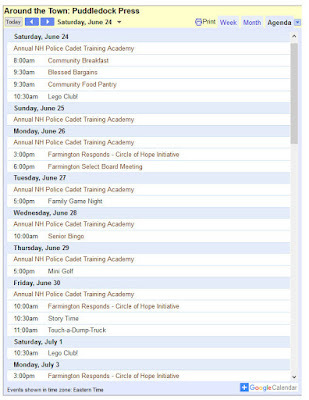 Farmington also has two Facebook groups the Farmington Community News and the Farmington Community Forum. The main difference between the two, beyond the number of members, is that the News is for, just that news and information.The forum is the place for broader discussion or controversy. Many of non-profits in town have their own websites and social media pages and the town website has a page, created by the Economic Development Committee, devoted to a listing of businesses & services in town. We hope this will help you find some of the things you need. Welcome to Farmington, NH!